Eleutherias Square stands out as a highly symbolic and programmatically important place. It comprises of a series of non-unified elements calling for a new holistic synthesis. This is indeed an area operating as a multi-programmatic node fed by the commercial and recreational activities of Ladadika, the central commercial streets of Eleftheriou Venizelou and Mitropoleos and the seafront Nikis avenue and promenade. The square is located at a critical distance both from the main monumental axis and public spaces of Aristotelous and Dioikiterion Squares as well as the remains of the western byzantine walls. The current shape and condition of Eleftherias Square is the product of Ernest Hebrard's Thessaloniki canonizing reconstruction, while on a socio-cultural level, maybe the most haunting local event challenging the social memory of the city was the second world war concentration of the Jewish Sephardim community of the city before their eventual tragic deportation and annihilation. This was the last act of Thessaloniki's cosmopolitan drama and in being so, it provides with a powerful inherent dynamic awaiting to be channeled back to the reality of the place. From a strictly architectural point of view, the square is defined by an array of non-standing out buildings, characteristic standard office buildings of the last 100 years, with few exceptions such as the Stein Megaron and the traces of the Wall. At the same time, the existing green needs to be enriched in order to claim the mass and the variety which would turn it to an important asset for the area as well as for the wider city. Based on the above, the following compositional priorities may be defined: i. The Square, as a multi-programmatic node condenses the surrounding activities (commerce, leisure and culture). Venizelou and Mitropoleos are being channeled to the plateau on its northern part and then whirled towards its central area while eventually output towards Ladadika and the Quai. 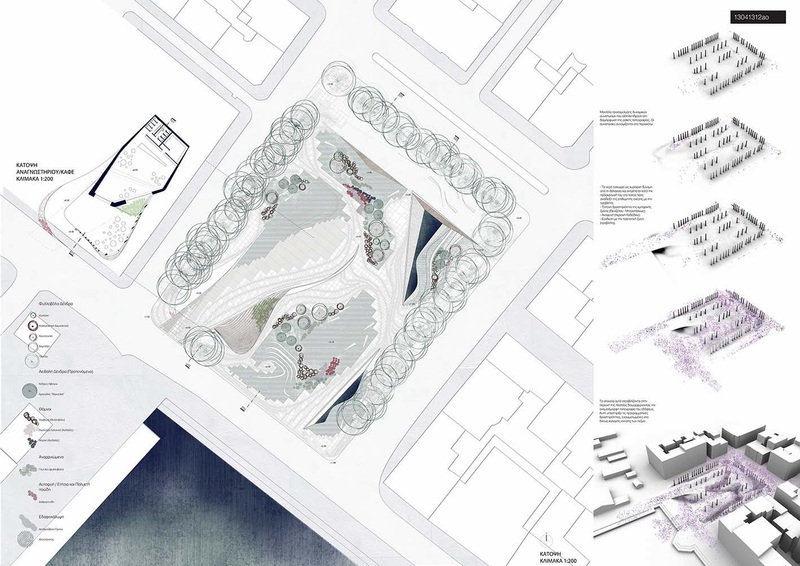 the outcome of this process is that the future functions are spread via a network of flows and activity poles dynamically introduced to the emergent urban scape. ii. The historical memory is related to the following elements of the concept: a. the old city and the ottoman city front are being symbolized as a whole by the trace of the byzantine City Wall present as a border between the flat zone connected to the commercial district and the irregular topography unfolding towards the sea front. b. The tragic incident of the Holocaust is metaphorically transferred to the semantics of the water which is adopted both as an element of purification and as an ubiquitous dynamic force active as a parameter defining the new topography. iii. The existing trees defining a Π shape surrounding three sides of the squares while their scale equals that of the adjacent buildings. At the core of the square a composite complex of new trees and other smaller scale plants are allowing the gradual bridging with the relative scales of the humans, the intermediate sub-areas and the whole area. Αναρτήθηκε από Nikolas Patsavos στις 10:33 π.μ.